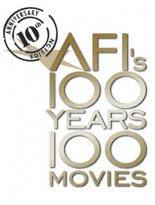 The American Film Institute in Los Angeles, California, in 2007 honored and updated its "definitive selection of the 100 greatest American movies of all time" from its 1998 list, as determined by more than 1,500 leaders from the American film community. See the entire winners list below for 2007. The 400 Nominated Films (for the 10th Anniversary Edition) were feature-length fictional movies produced between 1912 and 1996 with newly-eligible films from 1996 to 2006. The Romeo and Juliet tale gets resurfaced on the streets of New York with music by Leonard Bernstein and lyrics by Stephen Sondheim, based on their breakthrough Broadway hit. The Sharks and the Jets mix it up for some of the most memorable dance sequences in film history. De Niro is Travis Bickle, a New York City cab driver whose rage builds in a lonely, dark world, until his attempt to befriend and free Foster's 12-year-old prostitute from her pimp culminates in a violent shootout. "You talkin' to me?" The effects of the Vietnam war on a tightly knit community challenge the bonds of friendship and love. A game of Russian Roulette, first played in a POW camp, temporarily reunites De Niro with his estranged friend Walken in a back alley of Saigon. Altman's episodic antiwar film about a mobile medical unit during the Korean War gave American audiences a reason to laugh at the height of Vietnam. The overlapping dialogue and irreverent story thumbed its nose at all things political and pushed the boundaries of filmmaking. Grant is the Hitchcockian everyman caught up in something he doesn't understand as he travels from New York to Mount Rushmore in this mire of spies, counterspies and romance. A great white shark terrorizes the resort town of Amity. Spielberg shot some scenes at water level, making the audience feel as though they were treading water. John Williams' pulsating score still haunts swimmers around the world. No one believes a loser like Rocky Balboa can go the distance. When world heavyweight champ Apollo Creed wants to fight an "unknown," Rocky gets his shot in the ring and at love. "Yo, Adrian!" In one of his most famous films, lone Alaskan prospector Chaplin attempts to stave off hunger by dining on his shoe, much to the consternation of cabin mate Swain, who imagines that Charlie is a giant chicken. A grab bag of over twenty characters from politics and country-western music collide as the United States celebrates the Bicentennial in the capital of country music. Altman casts his director's eye on the overlapping stories, from a populist candidate to a music songbird on the verge of collapse, which ultimately end in a dramatic climax. The Brothers Marx defend Freedonia, with their own brand of anarchy and satire in this antiwar comedy that's a combination of Gilbert and Sullivan and vaudeville. Groucho and Harpo had perfected their "mirror gag" on stage and brought it to Depression-era audiences sorely in need of a laugh. Hugely successful film director John L. Sullivan wants to make a picture that means something, "A true canvas of human suffering." What he learns on his journey, as he becomes the architect of his own story is: "There's a lot to be said for making people laugh. Did you know that that's all some people have? It isn't much, but it's better than nothing in this cockeyed caravan." One night in the life of some high school grads becomes a turning point on the road to adulthood. Lucas' breakthrough film featured an ensemble cast of future stars and a non-stop soundtrack of 1950s and '60s hits. "Willkommen" to 1930s Berlin and the Kit Kat Club, where mischievous emcee Grey holds court and American entertainer Sally Bowles, played by Minnelli, lives life in divine decadence as the Nazis rise in power. Low ratings make for angry shareholders and veteran news anchorman Howard Beale takes the fall. But his rant, "I'm mad as hell and I'm not going to take it anymore," suddenly changes the picture and the lives of everyone at fourth-place UBS. Hepburn's a spinster who's spent her life saving souls for God and Bogart's a Godless soul in need of saving. Stuck onboard The African Queen at the outbreak of World War I, they ride the rapids, outsmart the Germans and find true love on location in the middle of Africa. Lucas and Spielberg's cliff hanging, action-adventure, propels archaeologist Indiana Jones across five continents in a race against the Nazis to find the Ark of the Covenant. Edward Albee's grueling play about marriage and deception features Taylor and Burton as battling spouses Martha and George who spend one Saturday night pouring out bitterness and recriminations when they invite a younger couple over for a drink. Eastwood directs and stars as a formerly notorious gunslinger forced to return to his murderous ways after his wife dies and his family needs money. The film was noted for challenging the morality of Western stereotypes created by American film. Hoffman stars in this comedy about a temperamental out-of-work actor who puts on a dress and lands the role of a lifetime in a TV soap opera. Love interest Lange and her lonely father make situations even more complicated in this gender-bending love story. Alex and his "droogs" terrorize the back alleys of London in this dark satire based on Anthony Burgess' stunning novel. After his capture and incarceration, an experimental aversion therapy seems to have "cured" Alex for good, but not in the expected manner, as it includes Beethoven's "gorgeousness and gorgeosity made flesh!" All of Private James Ryan's brothers have been killed in the line of duty. A unit of war-weary soldiers is forced to risk their lives to find the young man and bring him home. The film was a realistic and uncompromising account of the war often romanticized by Hollywood. Banker Robbins is wrongly convicted of murder and sentenced to life in a harsh Maine prison, which drips with corruption. His intelligence helps him gain the respect of his fellow inmates, including Freeman's entrepreneurial "Red," while secretly devising a plan to escape. The chemistry of Newman and Redford redefined the buddy movie. Goldman's script follows Butch and Sundance as they rob banks from the Old West all the way to Bolivia, making heroes out of anti-heroes. The movie's key song "Raindrops Keep Fallin' on My Head" is a fun counterpart to the actual plight of our friends. "I ate his liver with some fava beans and a nice chianti," hisses Hopkins' Hannibal Lecter, a brilliant serial killer engaged by Foster's FBI agent in an effort to capture another killer on the loose. Poitier is Virgil Tibbs, the Philadelphia detective drawn into a Mississippi murder case no one knows how to handle. Quincy Jones' evocative jazz score punctuates the heat and bigotry, but it is Poitier's "They call me Mister Tibbs!" and the slap heard 'round the world that made audiences cheer. Forrest will tell his story to anyone who will listen. Mentally challenged, he seems to be at the right place at the right time meeting everyone from JFK to Elvis to John Lennon and doesn't understand his good fortune. Breakthroughs in technology allowed Zemekis to digitally alter history to fit the world of Forrest Gump. Both a taut political thriller and detective story, Redford and Hoffman are Woodward and Bernstein, the two novice Washington Post reporters who uncovered the Watergate break-in and cover-up. Chaplin speaks! And ends the silent era with this film about a little man working on an assembly line, who is literally caught in the hub of an industrialized society, and after several trips to the hospital and jail, ultimately finds happiness with a kindred soul. Aging outlaws and relentless bounty hunters converge at the US-Mexico border in 1913. Slow-motion action violence became Peckinpah's calling card after the success of this Western masterpiece. Wilder's wry take on corporate America skewers the climb through the bedroom to the boardroom. Lemmon is a career-climbing executive who offers his boss' the use of his apartment for an extra-marital fling. His foolproof plan falls apart when he falls in love with his boss's girlfriend. "That's the way it crumbles, cookie-wise!" Kubrick's historic epic stars Douglas in the title role of the slave who leads a rebellion for freedom against the rulers of the Roman Empire. "I am Spartacus!" Murnau's shattering film of redemption and forgiveness is told in a simple story of a married farmer, lured to the big city by a "wicked woman. " A cavalcade of urban images and horrific storms almost destroy the farmer when he thinks his wife is lost at sea in this expressionistic masterpiece. Cameron's fictionalized account of the "ship of dreams" was both a grand love story and a monumental visual effects undertaking. "I'm king of the world!" Fonda and Hopper, better known as Captain America and Wyatt, hit the road on their choppers to find an America bitterly divided by the Vietnam war. On the way they pick up Nicholson, who gets turned on and tuned in. The original independent film was an anthem for the 1960s'cultural dialogue on freedom, individualism and patriotism. The Marx Brothers take on opera and give a drubbing to anyone who gets in their way. Some of the team's most famous comic moments are from this film: rearranging the bedroom furniture, Chico and Groucho tearing up the contract, and the overstuffed stateroom scene, where 15 people crowd inside! Based on Stone's own experiences as a grunt in Vietnam, Sheen is a young man from a privileged background who suddenly finds himself stuck between two officers with opposing ideas of right and wrong in a war filled with uncertainties. The conflict within a conflict results in the massacre of a village. In a jury room, Fonda methodically faces class and racial prejudices, and convinces eleven other jurors to change their verdict from guilty to not guilty, thus enabling an innocent young man to go free. Hepburn's heiress is mad for Grant's uptight paleontologist. The plot and characters define screwball comedy, not the least of which involves a pet leopard who can be soothed by listening to "I Can't Give You Anything But Love, Baby." "I see dead people." That's what young Cole Sears claims. At first, psychologist Malcolm Crowe thinks the boy is seeing things. Little by little he begins to understand. Prospective groom Astaire misses his wedding and must prove that he is marriage material. He heads to NYC, where he dances his heart out with Rogers to the songs of Jerome Kern and Dorothy Fields. Every song advances the plot and the courtship of two hoofers looking for A Fine Romance. Streep is a Polish immigrant living in Brooklyn with her flamboyant lover, played by Kline, and their Southern writer friend, Stingo. The more Sophie reflects on her painful life, the more she is haunted by her years in a concentration camp and the unthinkable decision she was forced to make. This gangster film for modern day is based on the true story of Henry Hill, played by Liotta, who dreamed as a kid of becoming a member of the glamorous mob who ran his New York City neighborhood. De Niro and Pesci are members of the family he ascends to, until he breaks the code and eventually falls from grace. Hackman's Popeye Doyle is based on a NYC cop who busted a heroin-smuggling operation with a French connection. His character is in sharp contrast with that of his nemesis, the elegant and dapper Alain Charnier. They play a game of cat and mouse all over the Big Apple, culminating in one of the most gripping car chases on film. Tarantino's tale of violence, corruption and redemption broke new ground with his non-linear story of two hit men who live by a strict moral code. They intersect the lives of a boxer, a crime boss, his drug-using wife, a couple of small-time crooks and of course—the Gimp! The closing of a movie theatre in a small Texas town during the 1950s marks the changes that face a group of young people coming of age. It's a sweltering summer day in the Bedford-Stuyvesant section of Brooklyn, and Sal's Famous Pizzeria becomes a lightning rod for racial tensions. The much-discussed close to the film presents different views on the conflict with quotes from Martin Luther King, Jr., and Malcolm X. The dark, rainy opening shot of Los Angeles in 2019 sets the stage for Scott's futuristic thriller, where "replicants," a powerful human-like species, have mutinied in an attempt to prolong their lifespans. Ford is the Blade Runner cop called on to hunt them down. Cagney sings and dances his way through the patriotic songs George M. Cohan composed in the early years of American vaudeville and musical theatre. Songs like Over There, It's A Grand Old Flag and Yankee Doodle Dandy inspired generations when the world was at war. Groundbreaking computer animation creates the world of Woody, a toy cowboy who suddenly finds himself as the second-favorite toy. Replaced by the newer and very high tech, but doltish, Buzz Lightyear, Woody gets accused of killing Buzz by tossing him out the window. It's a race to get him back. "To infinity and beyond!" This is a tale of two friends on the opposite side of politics and power, who come face to face in the film's explosive chariot race. Heston, the young Jewish Prince, seeks revenge for himself and his family, only to find forgiveness and redemption when he tries to help Jesus Christ, the man who once saved him. Of the films that remained on the list, 36 improved their ranking and 38 saw their ranking decline. Raging Bull (1980) (# 4) and Vertigo (1958) (# 9) made their top 10 debuts in the new list, replacing The Graduate (1967) (formerly # 7 in 1998) and On the Waterfront (1954) (formerly # 8 in 1998). Five of the top 10 films in the 2007 list won Academy Awards for Best Picture and all but two ( Vertigo (1958) and Singin' in the Rain (1952)) were nominated. The 1970s was the most represented decade with 20 entries. Directors Alfred Hitchcock, Stanley Kubrick and Billy Wilder each had four films on the list. James Stewart and Robert De Niro were the most represented actors in a starring role, each with five films in the top 100. Faye Dunaway, Katharine Hepburn and Diane Keaton were the most represented leading female actors with three films each. The most represented genre in the top 100 list was comedy films, with 17 films. Two animated films ( Snow White and the Seven Dwarfs (1937) and newly-nominated Toy Story (1995)). Five westerns: The Searchers (1956) (# 12), High Noon (1952) (# 27), Shane (1953) (# 45), Unforgiven (1992) (# 68), Butch Cassidy and the Sundance Kid (1969) (# 73), and The Wild Bunch (1969) (# 79). Five science-fiction films: Star Wars (1977) (# 13), 2001: A Space Odyssey (1968) (# 15), E.T. the Extra-Terrestrial (1982) (# 24), A Clockwork Orange (1971) (# 70), and Blade Runner (1982) (# 97). Six silent films: City Lights (1931) (# 11), The General (1927) (# 16), Intolerance (1916) (# 49) - the oldest film on the list, The Gold Rush (1925) (# 58), Modern Times (1936) (# 78) and Sunrise (1927) (# 82).